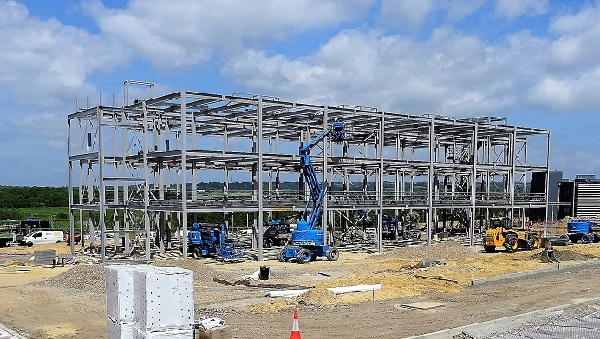 The steel frame has been erected for High Weald House, a new office block on Sea Change Sussex’s Bexhill Enterprise Park (photo: Sea Change Sussex). For Seachangewatch questions have to be asked about why Sea Change Sussex is providing a rent-free year for the Department for Work and Pensions staff due to move into its Havelock Place offices in Havelock Road in the town centre. 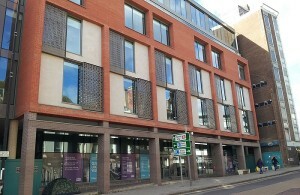 The repayment refers to the £7 million loan from the government’s Growing Places fund made available to Sea Change by Selep to finance the construction of Havelock Place. This was rescheduled for a first time last year as the company struggled to find tenants for all but one floor of the building. A further rescheduling may be necessary. According to Seachangewatch, comparisons with other offices available to rent locally suggest that DWP’s rent-free year is likely to cost Sea Change “at least” £400,000. The regeneration company was recently granted extra funds by East Sussex County Council – including £3 million taken from a walking and cycling package – to cover overruns on its North Bexhill Access Road and Queensway Gateway Road projects, with the company also contributing £2 million from its own reserves. Havelock Place, due to house DWP staff this year. The Sea Change spokesman said he saw the Seachangewatch press release as a non-story “because – as most people know – rent free period incentives are standard practice for large deals in the commercial property market. “The lease to DWP for Havelock Place provides Sea Change Sussex with a long-term, secure income stream which will enable the company to make full repayment of the loan,” he said. Completed in 2015, Havelock House was intended to create 440 jobs, but is so far occupied by only one firm. This is the radiology company Medica, which has some 75 employees in the building, up from around 50 when it moved in in 2015. The estimated 600-700 DWP staff due to move into Havelock Place and the University of Brighton’s adjacent Lacuna Place offices later in the year represent existing jobs – they are being relocated from Ashdown House near The Ridge. 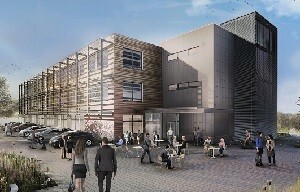 Meanwhile Sea Change is under way with the construction of High Weald House, which when completed in spring 2019 will, it says, be the only large, contemporary office accommodation available in the Hastings and Bexhill area following the letting of Havelock Place and Lacuna Place. Artist’s impression of High Weald House (image: Sea Change Sussex). Located on Bexhill Enterprise Park just to the west of Combe Valley Way – the Bexhill-Hastings link road – High Weald House has a total of 25,674 sq feet of office space suitable for small, medium and large firms in spaces from 600 sq feet up, Sea Change says. It is designed as a low-energy building, making the most of daylight and natural ventilation, and will have 115 parking spaces and 17 bicycle spaces. Although it was early days for High Weald House, there had been some initial interest and enquiries, the spokesman said. It may well be let as small offices on flexible lease terms, in which case incentives such as rent-free periods would not normally apply. This article was amended by Nick Terdre on 7 June 2018. A little investigation might show where the money came from for the bosses extravagant and multiple private properties came from. Well its stating the obvious, very few businesses will move to Hastings aka Channel 4 because its too cut off, Brighton and Ashford will always win. Until you get your roads and trains sorted, its going to be civil service jobs and subsidies, although you were lucky to get Saga lets hope they stay You only have to look at how quick businesses are leaving town River Island, Top Man, the Pier cant even get enough footflow to break even despite all the eateries on there! However maybe Primani will save the day! The SeaChange spokesperson says in a rather snide manner that this is a ‘non-story’ because ‘as most people know – rent free period incentives are standard practice for large deals in the commercial property market’. Maybe he’s right (or maybe he’s not) but it does seem odd to give a tenant a whole year’s rent for free and by doing so, be unable to repay the loan you got for the building. Isn’t that like me buying a buy-to-let property then letting the tenant off the first year’s rent, and going into arrears with my mortgage as a result? Doesn’t seem like the basis of a sound financial plan. The management record of Sea Change and its sister companies is pitiful. At North Queensway a projected 865 jobs became just six. It’s on the record that their buildings are not made to last (just 25-30 years according to the CEO), but the damage is permanent enough, as in Hollington Valley, as in once-historic Havelock Road. Why do HBC councillors have dealings with them? As for High Weald House being ‘the only large, contemporary office accommodation available in the Hastings and Bexhill area’, it reminds me of ‘the Oldest Established Permanent Floating Crap Game in New York’ (in Guys and Dolls). What of Ocean House, largely empty? What of Ashdown House, largely empty? What of the unwanted university building behind the old Post Office in Cambridge Road? Sea Change don’t seem to be trying very hard, as usual. A few years ago the then-chancellor (G Osborne) visited and boosted Lacuna House, and got it on the TV news: a fat lot of good it did the building or him. Medica have actually been desperate to take additional space in the building for quite some time but have been prevented from doing so by the arrangement with the DWP which they were not made aware of until it was signed. Medica is a growing business providing high quality jobs in the local area but has been prevented from expanding and now has to consider its future plans. Reading between the many lines here it is very clear something isn’t going go plan. And what about all the SSSI sites cleared along Queensway with the destruction of so much wildlife and trees? No takers on those cleared sites either – and isn’t it very concerning that Seachange and HBC seem such cosy bed fellows? All this goes unchallenged simply because Hastings is such a small town and nobody really pays too much attention to the ‘goings on’ here. It won’t be too long before the proverbial will hit the fan. The tragic loss of the historical Hollington Valley is another shameful and costly waste of money and protected wildlife and ancientt trees. And sadly it is the residents who are going to pay the price for these foolhardly and ill thought out actions. Private contractor/developer pie in the sky idealists get govt money to build something nobody asked for and nobody wanted or needed – more offices and office blocks and business units on industrial estates. Cannot rent it out to anybody, nobody wants it. Then after many years of building being empty and a “void” it is the govt and public departments who then rent it out and take it over and pay mega rents to the ones they already gave mega money to or as Hastings Council admits, “helps private developers to access public money as private investors think their ideas too risky or not viable” Something private has over public servants, the ability to see a dead duck before it has been built. Unless you get lots of public money doing it. Many major names are moving to smaller and smaller offices or out of town onto offices and units in remote places to avoid the mega rents of Hastings Borough Council in the middle of town, Many names been there for decades and family businesses gone. What a stupid waste of money mess again. And a loss of money again. Pity the lovely old buildings in Havelock Road were not kept instead. Destruction of architectural heritage; worthless new commercial buildings lying empty. Trebles all round. “non-story “because – as most people know – rent free period incentives are standard”. It’s “standard” is it, when you are unable to meet your repayments/loan. But then, did Mr Shaw run a business with a similar name that went bust?